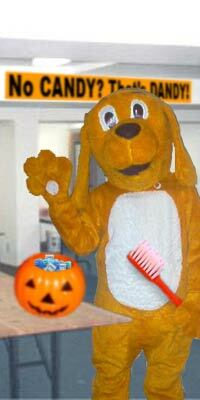 I wander about on Halloween, handing out dental hygiene products, but I have no memories of anything else! The first thing I can recall is showing up at a party in a church basement about sunset. I spent the evening giving children dental floss and little tubes of fruity toothpaste, and then the next thing I know, it's sundown at Halloween again. Is every day a holiday, or am I jumping a year through Time? Don't get me wrong, I love Halloween! I'm so happy to give kids Good Teeth Treats! I wonder, though, shouldn't there be more to Life? I'll give you a sackful of bubble-gum-flavored floss if you can tell me what the heck is going on! It's not your fault, but the very fact that you exist annoys me. It's not YOU, so please don't take it personally, but I believe you're the creation of wishful thinking by well-intentioned adults. What you describe sounds like you've been dreamed up as an Alternative Holiday Mascot with a Positive Message. You're still so new that you only exist for one day each year, when people are actually thinking about you. Only a few symbolic holiday entities have enough belief in them to persist between holidays, like Santa Claus, the Easter Bunny and Victor the Arbor Day Vole. If you catch on, you'll become more and more real. If you don't... well, let's not worry about that right now. The problem with having a Happy Puppy for a Halloween mascot is that it totally misses the point. Lately, parents have been trying to turn Halloween into a safe, non-threatening holiday, where children have a festive evening, without doing anything the slightest bit frightening or cavity-inducing. This is like celebrating Independence Day by watching two guys wave flashlights about, going "Eeeeeeeeeeeeee... BOOM!" Halloween traditions started in much simpler times. Young cave-children dressed in primitive costumes ("Thing With Big Fangs and Claws" was always popular), and scurried from cave to cave. The cave-adults would pretend to be frightened, and hand out roots and raw meat to make the "monsters" go away. Children being what they are, they'd often hide behind rocks and jump out at other children, shrieking like a sabre-tooth marmot, in hopes that someone would drop their armload of treats and run off. Sometimes it would be an actual predator doing the jumping-out, but that was just part of the deal. Did the parents hover over their offspring, watching for the slightest sign of danger? No. They were back at the cave, handing out bits of meat and keeping the giant cave-hamsters from stealing their home. Halloween taught children that there were scary, dangerous things in the dark. Learning to metabolize the fear was an important part of growing up, allowing them to become healthy cave-adults who could face down a giant cave-hamster without becoming a quivering mess. While I can understand modern parents wanting to protect their children from knowing that the world is a dangerous place, they may not be doing them a service by padding all the edges, blunting each corner and turning every fierce creature into a friendly mascot. Most people will never fight a vampire, be chased by zombies or have the hot breath of a werewolf on the back of their necks, but if that's the first time they feel the chill of mortal fear, it may well be their last. Sure, hearing the scary stories will make the little ones cower under the blankets at night, but when they aren't eaten in their sleep, the Paleolithic part of their brain figures out that they can survive being afraid. Those childhood nightmares aren't fun, but are a small price to pay for some life-saving confidence when facing the Things in the Dark. But all of this, Fluffy, is not your problem. If you find satisfaction in handing out dental hygiene products, go for it! You're actually fortunate; you know your Purpose in Life, and many people go their entire lives without figuring that out. So have a Happy, and Scary, Halloween!